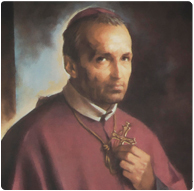 The Redemptorists » Happy Feast of St. Alphonsus Liguori! Gaze at the passion…you will find there all the reasons to love God. Today in 1787, St. Alphonsus Liguori died at the age of 91. Born the son of a naval officer and a devout mother, he founded the Redemptorists on November 9, 1732, in the hills outside of Naples. His mission was simple — to bring the good news of the abundant love of God to the poor and the forgotten. In the almost 280 years since that day, thousands of men have followed in his footsteps. More than 5,300 Redemptorist priests and brothers in 76 countries worldwide continue his mission today, giving their lives to share the message of plentiful redemption for all.